Last edited by TantalumRecycling; Today at 08:53 AM. Hey! just saw your ad on Forbes.com..... Nice job! Also, do you need all of the leads nicely pulled out of the board or is a quick clipper job off the board ok as long as the main body is in good shape? Unsolder them from the board and keep as much of the leg intact as possible. I get the impression that one, or both, of the legs can be/is solid Tantalum. Even if it isn't, depending on the sort of capactor I guess, it adds to the weight and the buyers aware of it anyway. Tantalum caps is something I wish I'd known about earlyer. But since I don't know what I missed out on, its not so bad. Older electronics can have quite a harvest, same with servers, same with car electronics. But you must know what to look for. The positive markings a giveaway, only Tantis have that, and the odd shape silver canisters in older stuff. 'paint drops' in car electronics. They are about the only thing to get from car electronics, weird that. [QUOTE=Hypoman;216269]Hey! just saw your ad on Forbes.com..... Nice job! We advertise in all major publications looking for any companies that are looking ft or a quotation. 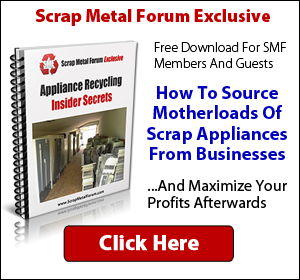 Tantalum Recycling is a full fledged recycling facility and not a trader of Tantalum Scrap's, This is the reason our company is capable of providing such high prices - I would suggest all companies and people speak to other companies about their prices before approaching us for quotations. 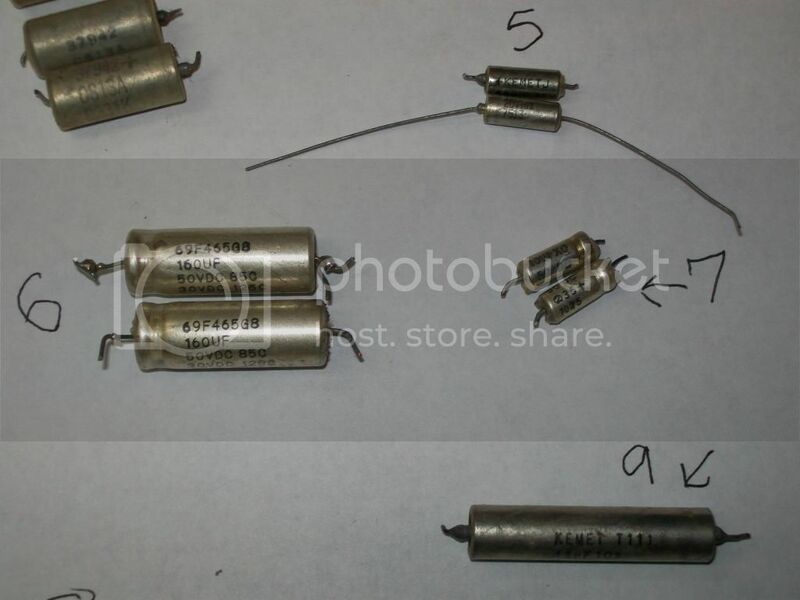 Actually people tend to mistakenly assume that the wires attached to the capacitor are Tantalum Wire but they are not - The legs (Wire Pins) on the capacitors are only Tantalum until they exit the capacitors and the legs are then either magnetic or nickel. 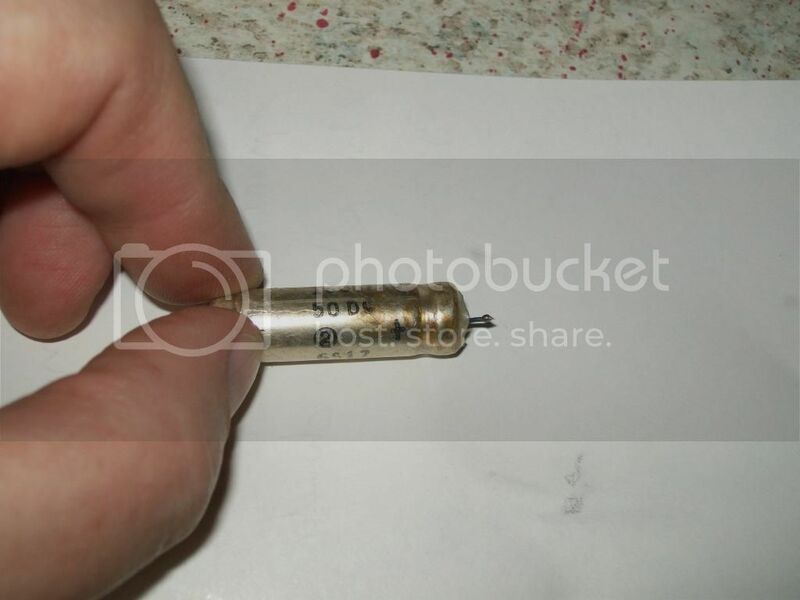 The actual wires on the capacitor do not weigh as much as people assume - sometimes as little as 1% -- It is usually better and easier to take off as much as possible until the full actual capacitor. The leads are definitely not as important as people make it out to be -- Even though it does not make a difference but we prefer that wires to be cut off as much as possible -- The wires are not Tantalum but either magnetic or nickel. I will attach pictures of three types of caps I found today, can you please help me identify type? There are two pics of each cap and I tried to get all the numbers on them. I am hoping I finally found one of the elusive silver ones!! 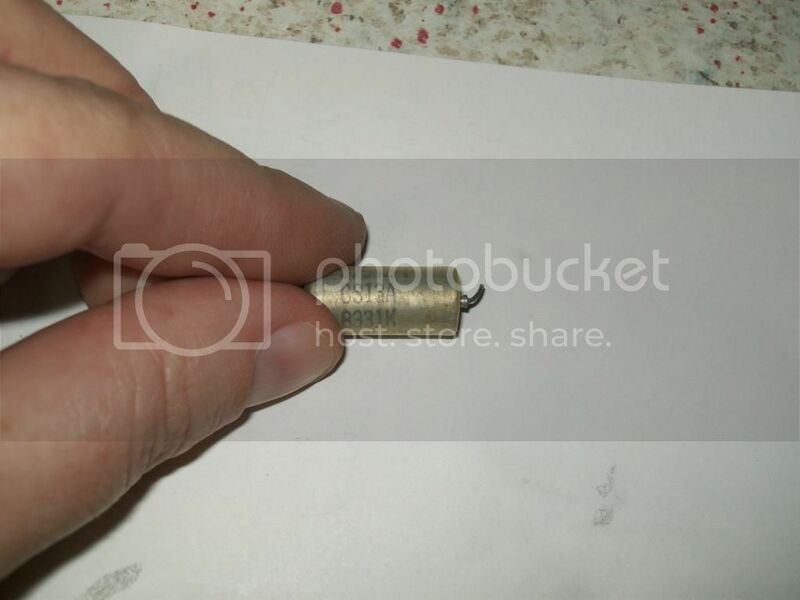 I think this one is a wet tantalum cap?? I THINK this is a Ag/Ta Cap?? pretty please?! 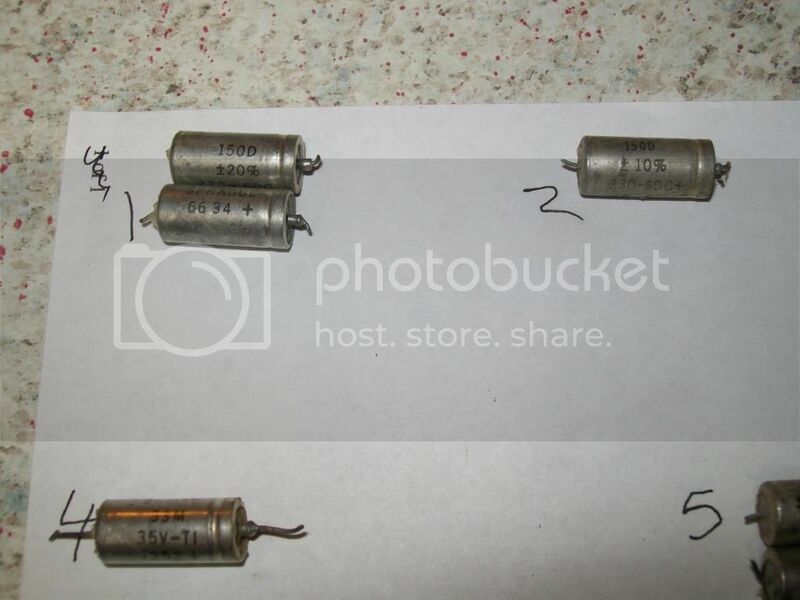 The top three pictures are Hermetic Capacitors -- The second set of pictures I actually believe are Aluminum Capacitors and not Tantalum at all, You would be able to figure the difference by the difference in weight of the hermetic and the second set. 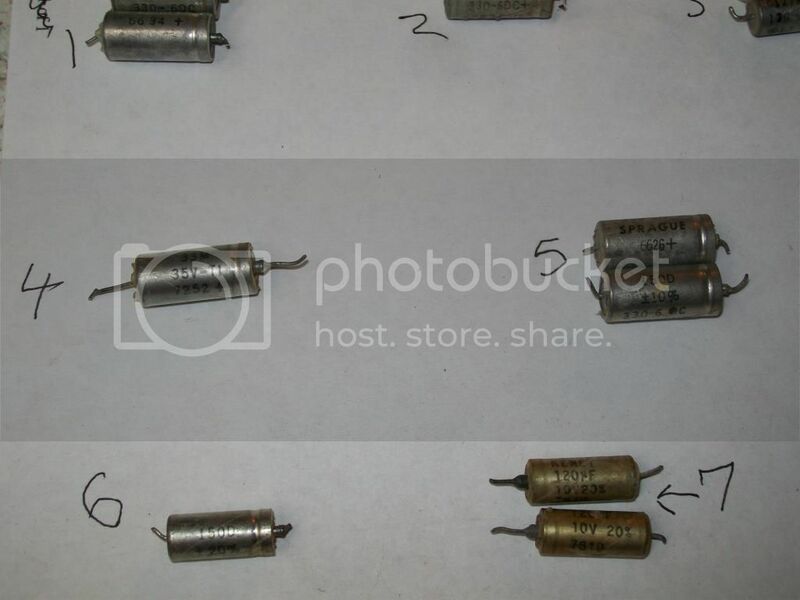 The Third set is Ag/Tantalum Capacitors. Thank you!! 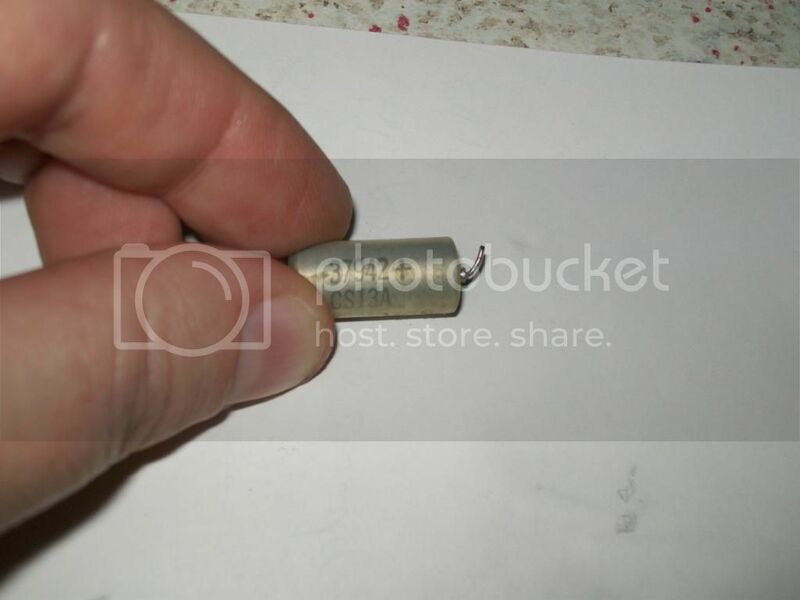 Is it the SHAPE, the crimps on each end, that lets you know the last set of pics is silver? 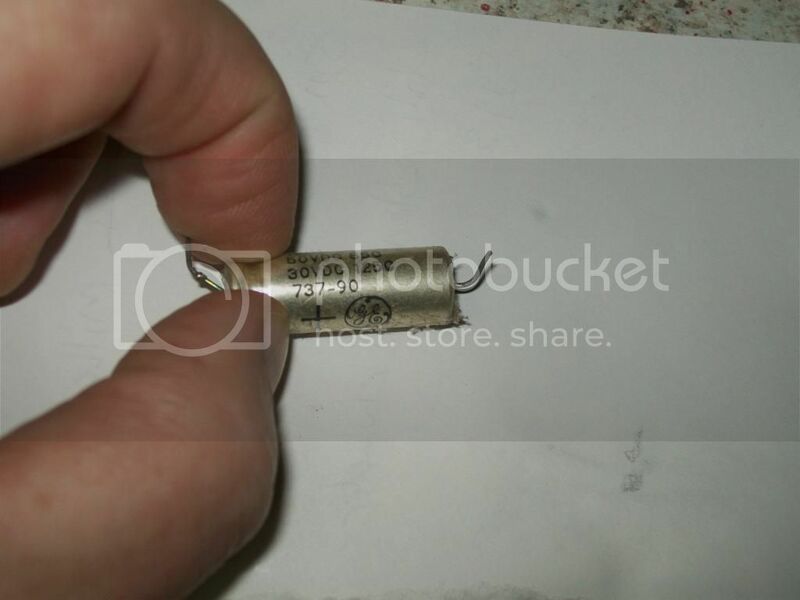 -And the second two pics are the same capacitor, just different numbers and it is quite heavy. 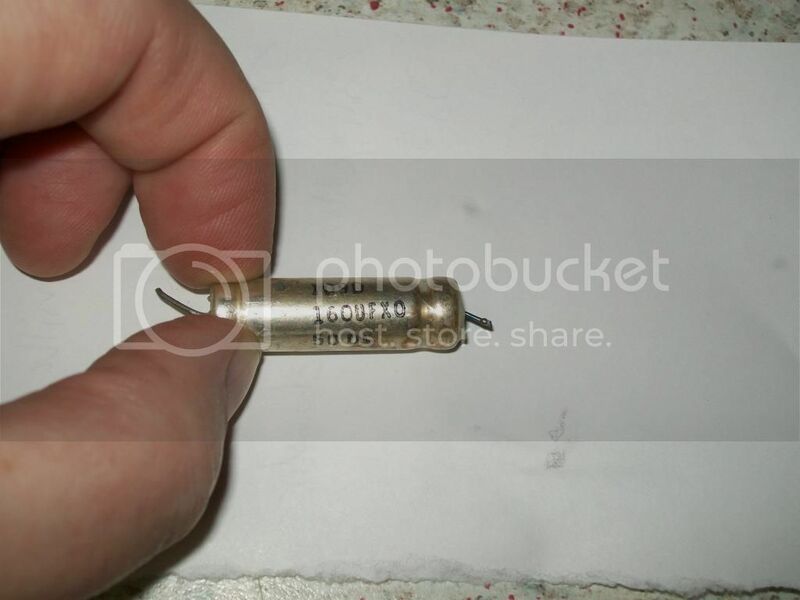 With the one crimp I thought it might be a wet Tantalum cap instead of just a hermetic? Hello - I have verified that the second picture is Ag/Ta as well. 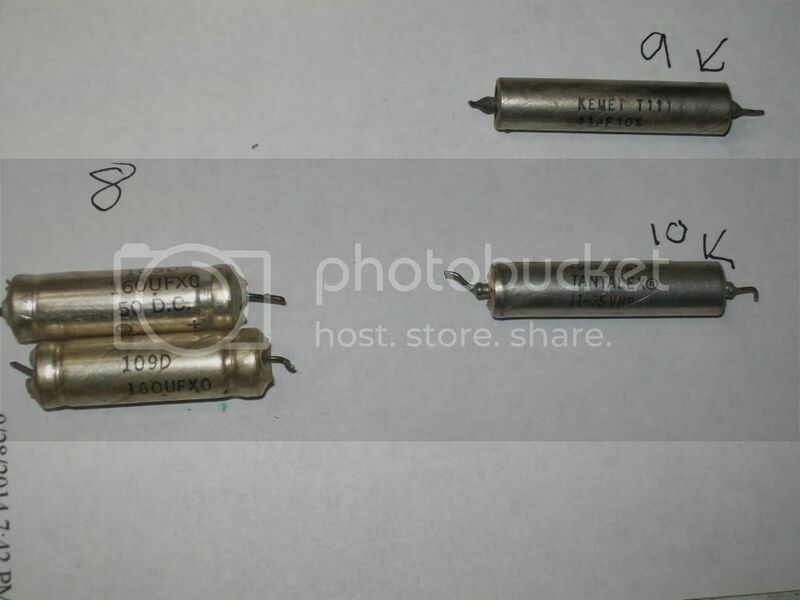 So the top is Axial Hermetic Capacitors and the bottom two types are Ag/Ta Capacitors. Okay a few more questions about the difference between axial hermetic, wet, and silver. -Plain hermetic will be shiny, and no crimps? -Do the "end cap" colors matter? red, black, white, metallic? -Will wet and silver always be crimped? Crimped once or twice? -Are all "dull" crimped ones silver? -I had thought the "dullness" came from the plastic wrap/case on some of them? I'm not trying to be a pest, I really want to be able to sort these correctly and maximize my money since there is a large price difference between these categories. I also want to stop missing these little buggers on any future boards. I have more photos of different similar types, would you prefer I load them in your thread with my questions or start a separate thread? Plain Hermetic does not have to be shiny but it has no crimps - the outside material is Brass. 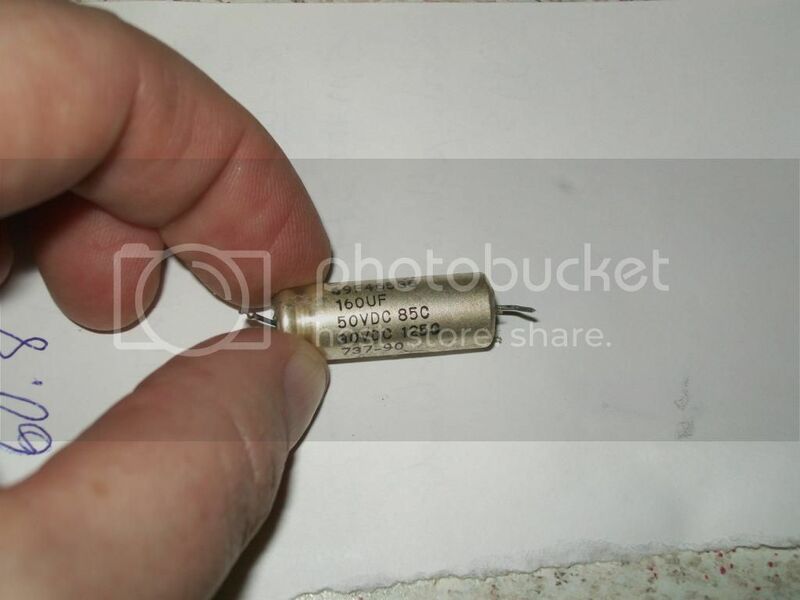 The end caps do not matter as it all depends on the age of the actual capacitor - When you will see a color opening on the top of the crimp it is almost always certainly Wet Capacitors. 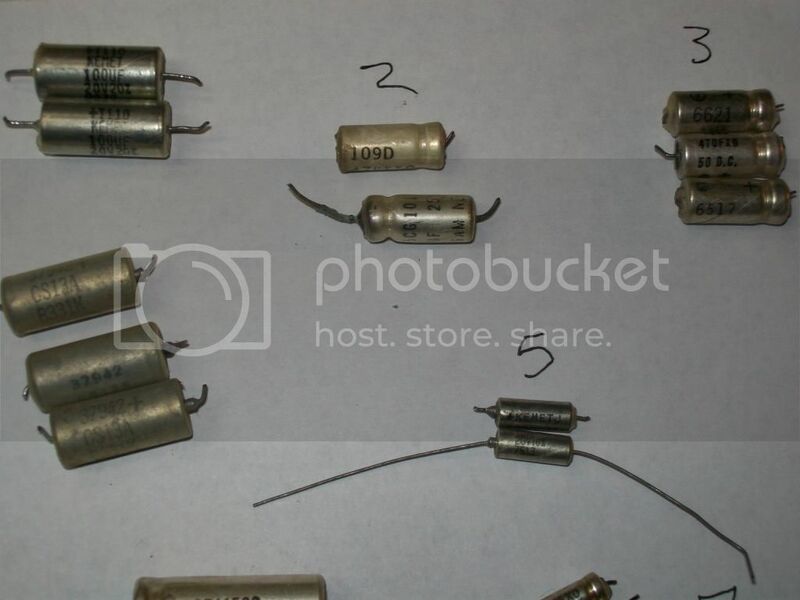 There are Silvers that are not crimp but not many of them - They are usually crimped only once which is considered to be the top of the capacitor. I am not totally sure what you mean by dull crimped ones - The Wets that are gun metal looking are Tantalum/Tantalum Wets and then there are also Copper outside wets but these were only produced for an extremely small period of time. Please load the pictures it would make things easier to explain. 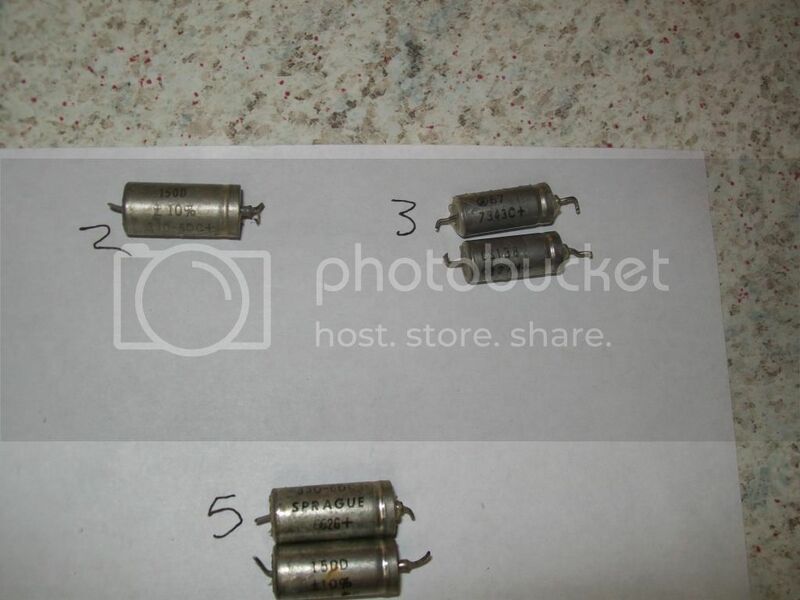 The capacitor in the last two pictures ABOVE was the first cap I found that appeared to have two crimps. Last edited by ScrappinRed; 10-06-2014 at 04:01 PM. 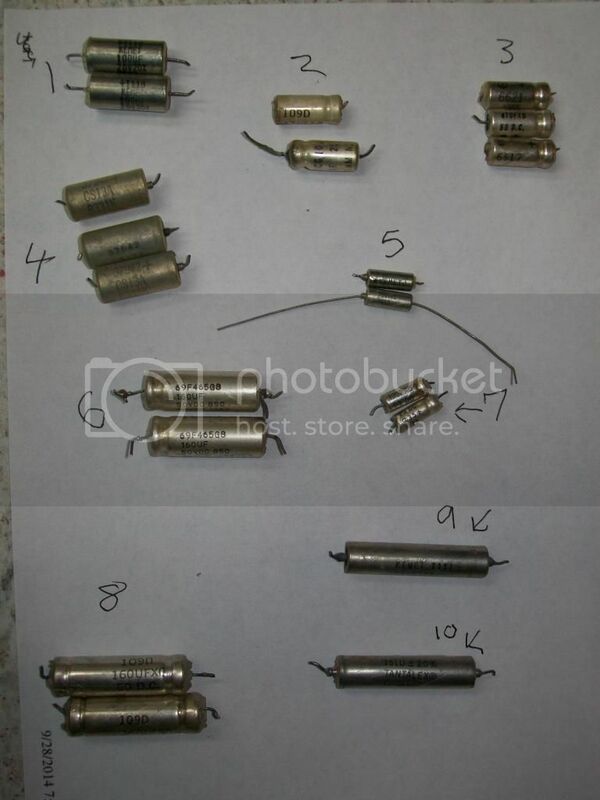 Thank you very much for the detailed picture this helps much with explaining the differences in types of capacitors. Thank you very much. 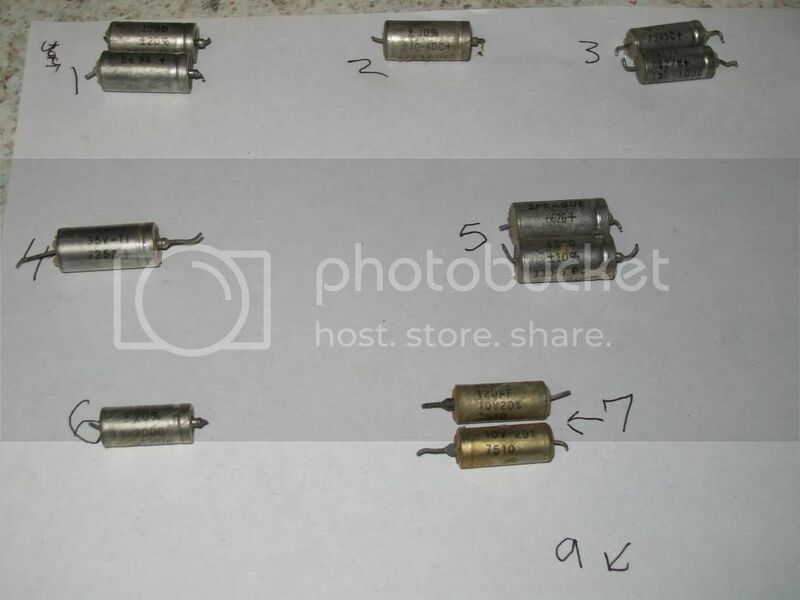 Here is a DIFFERENT set of tantalum caps, many are similar to the first batch but appear to have different part numbers. Apologies for any repeats, but again I am trying to tell the different between the Wet and the Silver.